History is made at night: Stone Age Dancefloors? 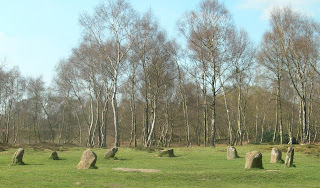 Last week I visited Nine Ladies Stone Circle on Stanton Moor in Derbyshire (pictured). This is one of many such sites in England to which is attached the legend that the stones are dancers, petrified ‘by a divine punishment because they have broken the rules of Sunday observance’ by dancing on the Sabbath. Similar stories have been told of the Merry Maidens and the Nine Stones in Cornwall, among other places. These stories postdate the building of these monuments by thousands of years, and are a testimony to the fact that for the Church authorities dancing ‘was suspect because it encouraged sexual attraction, and became yet more wicked if it diverted people from their religious duties’ (Westwood and Simpson). Nevertheless the notion that ‘standing stones are petrified motion, frozen music, arrested dancers’ (Stewart) may have some validity outside of later Christian folklore. It has been noted that stories may have arisen because ‘throughout the Medieval period people danced in a ring, so the visual analogy with a stone circle was striking’ (Westwood and Simpson), but ring dancing is a basic dance form that goes back much further. It is certainly possible that the creators of some stone circles were consciously seeking to represent dancers, perhaps to create a kind of permanent dance to reflect cosmic cycles of movement: ‘many such sites are aligned to stellar patterns and sightings, thus the dance of the stones reflects upon a geometric ground plan the dance of the stars’ (Stewart). It is generally presumed that stone circles would have been used for magico-ritual purposes, but this does not necessarily just mean solemn processions of druid-like priests. It is just as likely that all kinds of community seasonal festivities took place in such spaces, with the music and dancing associated with such rites in almost all known human cultures. So circles like Nine Ladies may be our oldest surviving dancefloors. R.J. Stewart (1990), Music, Power, Harmony: a workbook of music and inner forces. Jennifer Westwood and Jacqueline Simpson (2005), The Lore of the Land: a guide to England’s Legends.